Three signs the Believers’ earth-shattering exit may be near! The Jewish Feast Rosh Hashanah (AKA The Feast of Trumpets) is September 20/21, 2017. We wrote an article a few years back defending Rosh Hashanah as the most likely time of the year the Rapture would happen(1), regardless of the year. So each summer it’s always interesting to see how the prophetic signs are shaping up…could this be the year of our exhilarating departure? Several other ministries ARE predicting it will happen during Rosh Hashanah this year. 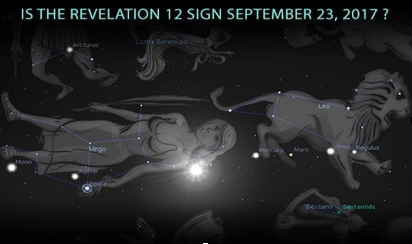 One guy has a whole website talking about Revelation 12:1 and the Rapture. You can buy the book that explains all this in a digital download for a mere $25. But if he really thought the Rapture was in September, why would he be selling the info instead of just giving it away? Don’t waste your money trying to understand HIDDEN signs few people know about. If this were truly a sign from God, it’s doubtful He would hide it in a constellation from 99.99999% of the world. No, God does things like parting the Red Sea or raising Lazarus from the dead, for ALL to see and ponder. Can we even know beforehand? That verse tells us that the coming of the Lord at Rapture will come without warning only for non-Believers. But Believers are encouraged to be alert to the OBVIOUS signs because we have the discerning light of God’s Holy Spirit. Therefore, it’s incumbent on Believers to be alert to OBVIOUS prophetic signs that the current Church Age dispensation, the Biblical time period in which we live, is coming to a booming close. So how’s everything stacking up this year? It’s an exciting time to be alive as we’re living in the generation that saw God, as prophesied, begin bringing the Jews back to their homeland. So our first gauge is to look at Israel. We’ve written many articles about their God-ordained return to their homeland. The main reason to watch Israel is that soon after the Rapture, the Jews will again be in the prime-time of God’s earthy dealings—God will come out of His Self-imposed slumber and the entire world will know it. The heaven and earth will be shaken to its core as He lets the world know that He is the Creator God and Israel is His chosen nation. It’s possible Israel’s government has put out the word to their media not to publicize these oil and discoveries so as not to give the surrounding Arab nations another reason to come after them. But the oil discovery within Israel’s borders was described as huge. BTW—All that Middle Eastern Oil is another proof that the Bible is 100% accurate. The massive amounts of oil in the Middle East is obviously due to Noah’s flood burying the lush and plentiful plants in-and-around the Garden of Eden. These buried plants naturally turned to oil (11) and today Saudi Arabia, Qatar, Iraq, etc., and now Israel, benefit from the destruction of Noah’s worldwide flood. The Israeli oil and gas discoveries mean the prophecy of Israel being so dog-gone wealthy in the latter days is being fulfilled right under our noses. (7) And when the Rapture takes place, and the Holy Spirit Restrainer is removed from the earth, Russia will obviously “devise an evil plan” and invade Israel. All this is detailed in Ezek. 38 and 39. The result of this invasion is that Israel is miraculously protected by God, Russia/Iran/others suffer a humiliating defeat and the Jews are awakened out of their spiritual slumber. On August 21, 2017, there will be a solar eclipse on the earth. This full eclipse of the sun’s light will only be seen in the United States, cutting a path from the Northwest to the Southeast. This is the first time in the history of the United States that a total eclipse will touch only the United States. But what makes this eclipse raise even more eyebrows is that another eclipse will do the same thing—exactly seven years from now, again seen ONLY IN THE UNITED STATES. Seven years—how interesting! 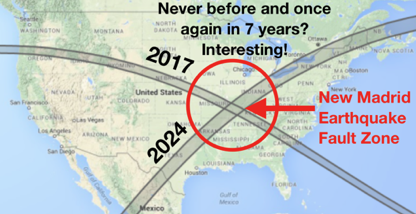 But rather than NW to SE, in seven years the eclipse will be from the SW to the NE, creating a big X on our nation. We already know the United States is the prophesied nation in the Bible that is destroyed in an hour(6). Does this big “X” mean God is trying to “give us a sign”? Maybe. Scientists have recently been studying the link between the sun, moon and earthquakes. 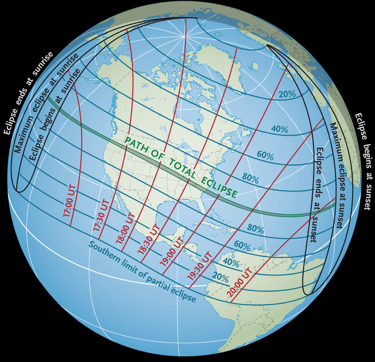 (10) So it’s most interesting that the eclipse will cross through the two main earthquake zones in America: Cascadia Subduction Fault Zone in the Coastal Northwest and the New Madrid Fault Zone in the heart of the Midwest. The eclipse also cuts across volcanoes in the northwest like the recently active Mt. St. Helens and the unbelievably large, but long-time dormant, caldera in Yellowstone National Park. The Lord may have used the numerous volcanoes around the world as water portals for the flood of Noah. (16) So hope those things stay put for now! For all my Christian life I’ve wondered why the Jewish Calendar was so far off. The Jews, always trying to keep the letter of the Law, are so precise in everything Biblical that they do. But the Jewish calendar says we’re in the year 5777. And common sense says that’s off by some 200+ years. James Ussher, an Irish bishop, wrote an incredible book on biblical chronology in the early 1650s. Using Biblical lineage, he sets the date from the Garden of Eden to Jesus’ birth to be 4004 BC. So by simply adding 2017 since Jesus’ birth to the 4004 years before Jesus’ birth, it totals to 6021 years from Adam to today. 6021 is an interesting number because Jesus died in 30AD. And if you add seven years for the Tribulation, we’re within a couple of years of completing two thousand years of the Church Age. But the Jewish calendar shows we’re in year 5777. So, being that far off I never paid much attention to it. Until now! It turns out, according to an interview I watched of Michael Norten at a Texas prophecy conference last week, that in 160 AD a Jewish rabbi named Yose Ben Halafta first created the Jewish calendar. But he strangely subtracted some 200+ years from his total years counting from Adam. Purportedly, the reason for the change was that Ben Halafta realized that dating the calendar using a literal method would point to Jesus being the Messiah. He apparently saw that the prophecy in Daniel 9—483 years from the beginning of rebuilding Jerusalem’s walls to the coming Messiah, would point directly to Jesus as the Messiah. Oh dear, can’t have that! So the theory is that Ben Halafta subtracted some 200+ years from the Jewish calendar so the Daniel 9 prophecy would not point to Jesus’ Triumphal entry into Jerusalem. When you add back 200 years to 5777, you get 5977. Add 7 years for Tribulation and you get 5984, which is getting close to 6000 total years. And who knows how many total years he subtracted! Norten believes it was 214! That would mean the Jewish calendar should be 5998. And in September, Tishri 1, the Jewish new year, it will be 5999! Why is 6,000 years so interesting?I’ve taught for over 30 years that God’s creation week of six 24-hour days and nights and one 24-hour day and night of rest is His divine template of earthly time. (13) In other words, when the Lord created time, He created 7000 total years from beginning to end. Not to mention that there are two verses where God pointedly refers to one day being “like” a 1000 years. Therefore, the first four days of creation would be a template the first 4000 years of human history. No life was created in the first four 24-hour days. 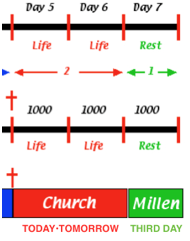 Then, after 4000 years of recorded history, Jesus came to earth and brought “life,” in day five of the template. This remarkable unfulfilled prophecy states that Israel would be wounded and torn for two days, but that God will raise them up on the third day and they will live in His presence. No one seems to be able to explain this verse. But if you apply this verse inside the 7000-year template, the prophecy states that for 2000 years, Israel will be wounded and torn, but not destroyed. And after the 2000 years, God would raise Israel up to live in His presence for one day, which equals 1000 years. Well, that’s what happened. We know for a fact that Israel rejected her Messiah and for almost exactly 2000 years, Israel has been scattered around the world, torn and bruised. Israel is waiting for the “third day” where they will live in His presence. God is currently gathering the Jews once again in their homeland where they will soon begin living in their Messiah’s world-ruling presence for 1000 years. The 7th day of the Creation Week, God rested. This equates to the 1000-year reign of Jesus on the earth. 4000 + 2000 + 1000 = 7000 total years. Applying this to our 7000-year divine template, the “two days” would be the 2000 years of Jesus going to the Gentiles. And after that 2000 years, He would return to the Jews for “one day,” or 1000 years, which is, of course, the Millennial reign of Christ with Jesus living and reigning from Jerusalem. Another fascinating example is Exodus 19. This one gives me chill bumps. Buried in the Old Testament is a direct reference to the Church Age and the Millennial Reign of Christ. 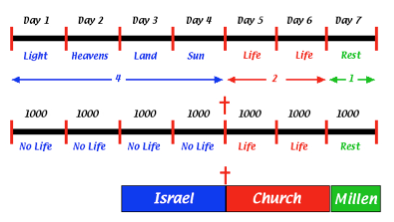 So we believe God laid out 4000 years of time before Jesus came and brought life for 2000 years, 6000 total. We still have remaining 1000 years of rest, which is Jesus’ reign as King of the Earth. This 7000-year Divine Template makes the end of 6000 years of human history quite interesting! We like this topic so much we’ve invited Mr. Norten to speak at our March 3, 2018 Steeling the Mind Bible Conference at the Coeur d’Alene Resort. Should be a good one! Watch for details! As for the timing of the Rapture being this year—we may not know the day nor the hour, but it sure is fun watching for the season! It WILL happen one day in the future! • During a solar eclipse, the Moon’s shadow is cast upon the Earth. 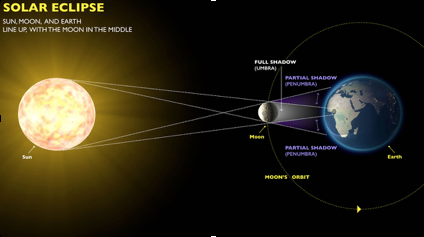 There are two parts to this shadow – an outer shadow that covers a wide region creating a partial eclipse and a much smaller central shadow that creates the total eclipse. As the Earth rotates, the central shadow creates a thin path known as the path of totality. • Those outside of the path of totality will experience a partial eclipse, an event nowhere near as dramatic as a total eclipse. • A total solar eclipse occurs somewhere on the earth once in every 18 months on average. • In any one location, a total solar eclipse is very rare, occurring on average once every 375 years. • Even if only 1% of the Sun is visible, it is still 10,000 times too bright to see the exciting eclipse phenomenon. You must be within the path of totality to feel the full experience. • Even those who know what is happening can be caught off guard by a total solar eclipse. It is eerie, awe-­inspiring, unsettling, beautiful, and often emotionally overwhelming. • It is essential to consider eye safety when planning for the eclipse. People must use APPROVED solar filters to view the partial phases of the eclipse. Don’t risk blindness! • Totality can be viewed safely with the naked eye, but only if you are in the path of totality.